Make yourself at home in one of the 55 guestrooms. Wireless Internet access (surcharge) is available to keep you connected. Bathrooms have showers and complimentary toiletries. Conveniences include desks, and housekeeping is provided daily. Featured amenities include a business center, express check-in, and express check-out. Planning an event in Hvar? This resort has facilities measuring 40903 square feet (3800 square meters), including a conference center. For a surcharge, guests may use a roundtrip airport shuttle (available 24 hours) and a ferry terminal shuttle. At Pharos Hvar Bayhill Hotel, enjoy a satisfying meal at the restaurant. Mingle with other guests at the complimentary reception, held daily. Relax with a refreshing drink from the poolside bar or one of the 2 bars/lounges. A complimentary buffet breakfast is served daily from 7 AM to 10:30 AM. Make yourself at home in one of the 20 air-conditioned guestrooms. Rooms have private balconies. Complimentary wireless Internet access keeps you connected, and satellite programming is available for your entertainment. Private bathrooms with showers feature complimentary toiletries and hair dryers. With a stay at Adriana Hvar Spa Hotel in Hvar (Hvar Old Town), you'll be steps from Franciscan Monastery and Heritage Museum and Hvar Loggia. This 4-star hotel is 0.2 mi (0.3 km) from Momo Beach and 0.3 mi (0.5 km) from Benedictine Monastery. Situated near the beach in Fort Lauderdale, the themed resort is close to Bonnet House Museum and Gardens, Hugh Taylor Birch State Park and The Gallery at Beach Place. Also nearby are Galleria and the International Swimming Hall of Fame. Miami International Airport is about 51 km away. This air-conditioned themed resort has 36 rooms. Guests are welcomed in the lobby, which offers a 24-hour reception and a 24-hour check-out service, as well as a hotel safe, a cloakroom and a complimentary newspaper stand. High-speed wireless Internet access is complimentary. The pet-friendly resort also offers barbecue grills, a media library and room service. Complimentary parking is available on site. All rooms are en suite and feature a shower and bath, as well as a double or king-size bed, a direct dial telephone, satellite/cable TV a clock radio and free wireless Internet access. Additional amenities include a CD player, a DVD player, a safe, as well as a mini fridge, a microwave and tea and coffee making facilities. Additionally, rooms include an ironing set and individually regulated air conditioning/heating. The themed resort has 2 outdoor swimming pools on site with sun terraces and sun loungers. There is also a spa tub, a gym and a hot tub. Guests are offered a complimentary continental breakfast. To reach the resort from Fort Lauderdale International Airport, exit the airport via US Route 1 north. Follow US Route 1 to Sunrise Blvd. Turn right (east) on Sunrise Blvd. to A1A (Fort Lauderdale Beach Blvd.) and turn right (south) on A1A to the third set of traffic lights. Then turn right on Terra Mar Street. The resort is just two short blocks up on the left. This charming hotel is located in Island Hvar. The hotel consists of 54 guests rooms. This hotel was completely renovated in 2002. Hotel Podstine Exclusive offers Wi-Fi internet connection in communal areas. The reception is open 24/7. This is not a pet-friendly hotel. The car park may be useful to those arriving by car. Transfer service is available for guests' convenience at Hotel Podstine Exclusive. Travellers may practice sports or enjoy activities offered on the premises. Some services may be payable. Make yourself at home in one of the 7 air-conditioned rooms featuring kitchens. Flat-screen televisions and DVD players are provided for your entertainment, while complimentary wireless Internet access keeps you connected. Conveniences include refrigerators, and rollaway/extra beds (surcharge) can be requested. This 3 star hotel is located in the city centre of Hvar and was established in 1948. It is close to the Old Town Hvar. One of the most spectacular of the Croatian islands on the Dalmatian coast, Hvar is home to white sandy beaches, rolling hills and lush vegetation, and Hvar Town itself is a perfect place to explore winding stone streets and historical Gothic palaces. In the heart of Hvar Town is the 4,500 square metre St Stephen's Square, one of the largest town squares in Dalmatia. The oldest parts of the town, reaching as far back as the 13th century, started from the north end of the square while the southern end was built from around the 15th century. A well at the north end of the square dates back to 1520. One of the best places to see the town is by climbing upwards to the impressive Fortica citadel, originally built on the site of a medieval castle used to defend against the Turks, then strengthened by the Venetians during the 16th century and renovated by the Austrians in the 19th century. Even if you're not interested in the history, you'll definitely be interested in the spectacular view of the harbour. The Cathedral of St Stephen overlooks the town square, built during the 16th and 17th centuries on the site of an older cathedral destroyed by the Turks. Even though the old cathedral was destroyed, remnants can still be found in the nave of the current cathedral. Another must-see religious spot is the 15th century Franciscan Monastery & Museum, which holds an edition of Ptolemy's Atlas printed in 1524 and a 16th-century painting of The Last Supper, made by the Venetian artist Matteo Ingoli. The Benedictine Monastery to the northwest of St Stephen's Square is also a great place to visit. Set off from Hvar harbour and you'll soon find yourself in the warm blue waters of the surrounding coast. A peaceful boat-trip around the area can be a great way to soak up the Mediterranean atmosphere, or if you're feeling more adventurous there's plenty of opportunity to take part in a range of watersports – from Kayaking around the Marjan peninsula to sailing around the stunning Pelinki islands. 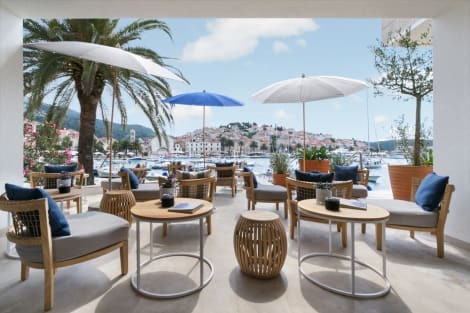 Hvar hotels are famous for Mediterranean and Balkan cuisine, and the town boasts an excellent range of places to grab a bite to eat. Zlatna Školjka is nestled in narrow alley close to the harbour and serves everything from seafood stew to lobsters, while Konoba Menego is located close to the Fortica citadel and serves simple and delicious Dalmatian cuisine. After the sun sets, make your way to the renowned Carpe Diem club for a night of dancing, music and cocktails.